In this installment of the Global Freshwater Seed Accelerator Spotlight, The Water Council sits down with Shajan John, President of NEW Works, a division of the consulting company, Mahattil International LLC. Shajan and NEW Works are late entrants into the Global Freshwater Seed Accelerator program, but have wasted no time getting up to speed and assembling a workstation in the Flow Lab at the Global Water Center, which will celebrate its launch on Monday, February 10, 2014. To learn about the other start-up companies in the Global Freshwater Seed Accelerator program, please visit our feature Archive. Welcome Shajan, please tell us about your company based here at the Global Water Center, and your mission. NEW Works, is a division of Mahattil International LLC. Mahattil International is my own management consulting company. The mission of NEW Works is to train professionals, accelerate technology transfer and transform communities using appropriate technologies for water management. How will NEW Works accomplish this while at the Global Water Center? NEW Works is establishing a state-of-the-art laboratory to offer practical hands-on learning covering the entire water cycle at the Global Water Center, to be housed in the Flow Lab on the 1st floor. There are various definitions of the water cycle, for our purposes let us define the water cycle as: drawing water from source, whether it is groundwater or surface water; pumping water into storage; disinfecting/cleaning water; then pumping water up into a water tower; next distributing that water to homes and industry; collecting wastewater and storm water; transporting this combined water to a treatment plant; processing it through a wastewater treatment plant; and finally, returning it to the environment. We are simulating that entire water cycle with 4 different systems; Water Purification, Water Supply, Wastewater Transport and Wastewater Treatment, that can work together as a complete system, but also independently from one another. Each station will be utilized in any of the 6 learning modules that we have developed encompassing the full water cycle. What are the learning modules that NEW WORKS has developed, and what can people expect to work on in each of those? The 6 core training modules are: Water Purification, Water Supply, Wastewater Transport, Wastewater Treatment, Monitoring & Controlling Operations, and Energy Optimization in Water Treatment Plants. Station 1 will be used in the learning modules of Water Purification; and Energy Optimization in Water & Wastewater Treatment. 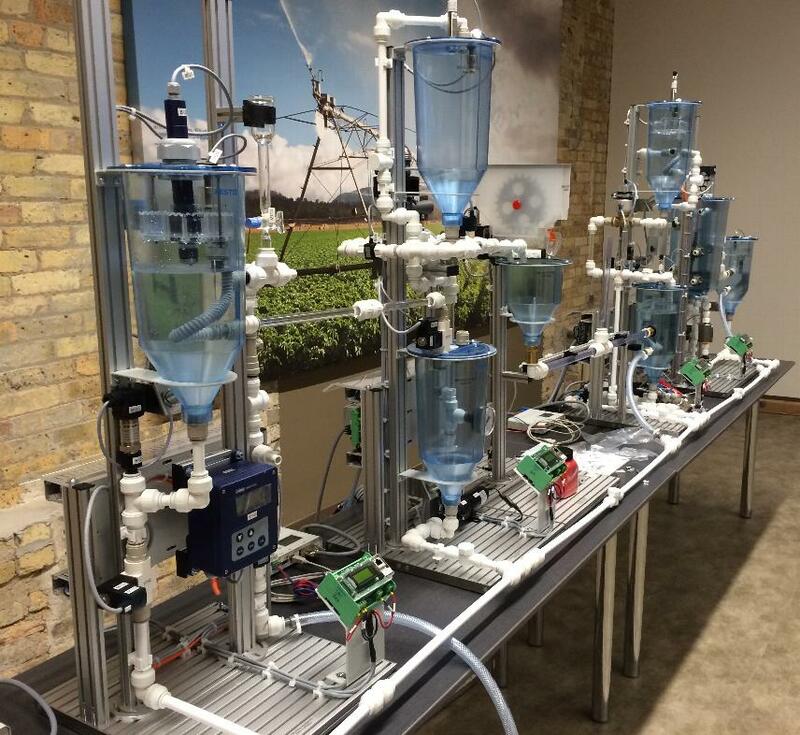 Station 2 focuses on Water Supply: the modules that will utilize this station are Water Supply; Monitoring, Controlling and Optimizing Plant Operations; and Energy Optimization in Water & Wastewater Treatment Plants. Station 3 examines wastewater transport systems; it will be used during the learning modules that involve Wastewater Transport; Monitoring, Controlling and Optimizing Plant Operations; and Energy Optimization in Water & Wastewater Treatment Plants. Station 4 focuses on wastewater treatment systems, used in the modules for Wastewater Treatment; Monitoring, Controlling and Optimizing Plant Operations; and Energy Optimization in Water & Wastewater Treatment Plants. The focus of our applied research and training is going to be in the process control and automation fields in the water industry, such as sensors, control pumps, valves, etc. ; not necessarily the best filtration system, or best disinfectant system. We will use this system to train people with practical, hands-on, quick turnaround-short duration courses that use stackable competency building course curriculum. We will also use the same system to do applied research with industry and municipalities; for example using it for modeling and simulation to answer “What if?” questions. How long do the courses run, is it something that can be completed in a few weeks, or does it require a longer time commitment? This is not a degree-granting program, this is intended to be a training that can quickly equip somebody with the skills to be able to function at an advanced level in the water industry. Those are very key terms, it’s a quick turnaround skilling of ANYONE interested in entering or improving their position in the water industry. For example, let’s say a new person with an automation background is looking to enter the water industry; they will receive a very specific, quick turnaround training of honing their automation understanding, specific to the water industry. Or, say a sales engineer wants to enter the water industry; we will provide them with a quick, broad understanding of the water cycle from a technology standpoint, to become a more effective sales engineer. It is the same for a customer service agent or even an accountant; all of these modules will be quick turnaround training that is stackable, depending on the position you are entering, or looking to enter in the water industry. If I were to classify this training I would do so in 2 ways: employability training, making someone more employable because of the specific industry skills and knowledge; and productivity training, improving the productivity of current employees by providing them with the latest technology that they will then in turn go back and implement and initiate projects with this new knowledge, ultimately improving the overall productivity of the operations. How did you become involved with water? My undergraduate degree is in Mechanical Engineering; I also have a Master’s degree in Engineering Management from the Milwaukee School of Engineering. In my career I have done 3 things that led me to creating NEW Works: I conducted applied research in motion/process control technologies; completed training administration in automation and motion control fields; and I have experience in Global business. In recent years, I witnessed the desperate, global needs for water infrastructure and water solutions that require a high degree of technology, as a result of volunteer work that I was doing relating to water, energy and sustainability. The insufficient supply of skilled people to maintain and operate these systems is what motivated me to enter this field. A report by the UNESCO-UNEVOC, published in 2012 called, Skills Challenge in the Water & Wastewater Industry 2012 documented this and made recommendations on how to address this issue. The idea behind NEW Works is developed in partnership with FESTO Didactic, a Germany based global company that developed a training system in response to the skills challenges that were reported. That system was piloted in South Africa with the support of multiple German development agencies in 2012. During my ongoing consulting engagements with FESTO, we discussed the establishment of the Global Water Center in Milwaukee and the work of The Water Council. Together we concluded that it would be a right fit to locate this capability within the Global Water Center as a first in the western hemisphere, alas, here we are! That ultimately relates back to your mission to Train, Transfer, and Transform. Exactly, we are training and transferring technology know-how to others, thus producing talent to meet industry demand, and the third outcome is we want them to design, build and become operators of modern, decentralized, water management systems, which will come later. Initially, the first steps are training, consulting and placing of people that are trained in these systems and processes. The first major market need we want to address is the global shortage of technicians and engineers in the water industry with the knowledge of process control and automation fields. Most of my career has been defined by entrepreneurship whether it is creating entirely new businesses or markets inside of my employer organizations or creating my own with lot of help, of course. The common factor in all of these ventures or initiatives is the value creation, identified as making connections between marketplace trends or parallel activities that are not yet connected. When I needed flexibility in my personal life for balancing time between two regions on opposite sides of the world, I started Mahattil International as a global business consulting company, offering services to corporate leaders in my trusted professional network. This allowed me to apply the above criteria for value creation in multiple projects as a consultant. Ultimately, I knew that at the right time I would pursue one that I am passionate about with greater skin in the game for the long term. Potential of this venture was identified through the consulting work that I had been doing in capacity development for mechatronics education, training and applied research, in India. Sometime last year I learned of an opportunity to bring NEW Works to the Global Water Center in Milwaukee. We would fill a gap, utilizing mostly existing assets, by pulling said assets together and executing a focused plan. Support and encouragement by the State and The Water Council in the form of recognizing my proposal to be worthy of being accepted into the Global Freshwater Seed Accelerator Program was also key in deciding to locate here, at the Global Water Center. What have been some of the challenges that you have faced along your journey? When I started Mahattil in late 2007 it was challenging because it was on the cusp of the global financial crisis, in 2008. Surviving the economic downturn was challenging having to shelve plans that were fully developed and unable to continue work that was started because of the economic uncertainty and so forth. The biggest challenges that I have faced in my entrepreneur journey are from the macro economic factors or global events that one has little or no control over. Challenges that I encounter ultimately turn into learning opportunities and I use it in my work as a problem solver. The genesis of this idea was when I had repeated requests to help provide engineering consulting solutions for water management and recognizing how tight and difficult talent was to find, that had the skills to do work in automation and process control in the water industry. It was recognizing and realizing the challenge that was the motivation behind this new initiative. What advice would you give to professionals looking to enter the water industry or start a water-related business? My recommendation to entrepreneurs is always the same; find an unmet need where you can apply your skills to create a profitable solution and business that you will find fulfilling. Your solution will undoubtedly have a buyer. Throughout my career I have invested time and effort into building a strong trusted professional network – mostly by giving without asking what’s in it for me and by volunteering in activities outside of my field. Building such a trusted network that can be a source of future projects, support and referrals is another key recommendation I’d offer. What are some of your main goals you hope to accomplish while at the Global Water Center? Foremost, getting NEW Works established so it’s up and running, but also, the core goal that I wish to accomplish is full integration into the Global Water Center ecosystem. My interest in the Global Water Center stems from the Center’s desire to become the world water hub; a place that provides solutions for global water problems. I want to be fully engaged with that network, in terms of responding to the needs and solutions that I can identify, but also others that will come here seeking that solution. What would you like our audience to take away from this interview? Integrating with the ecosystem here and developing relationships that can respond to the needs both domestically and around the world from a water management standpoint are what are most important to me, and I feel that having a presence at the Global Water Center will allow me to accomplish that. Also, I am interested in collaborating or partnering with just about anyone that aligns with our mission of training people, technology transfer, and building appropriate technologies to transform communities. The key thing I’m interested in is identifying collaborators and partners to work with – we invite people to reach out to us, to pursue those opportunities. The spirit of this building invokes that idea, it’s an environment for collaboration and innovation. For more information regarding NEW Works, or questions about partnerships, please contact Shajan at water@mahattil.com or call 262.671.4291. This entry was posted in Events, Global Freshwater Seed Accelerator Program, Global Water Center, Water Accelerator Center and tagged Global Freshwater Seed Accelerator, Global Freshwater Seed Accelerator Program, Global Water Center, Mahattil International, NEW Works, Shajan John, The Water council, Wisconsin Economic Development Corporation. Bookmark the permalink.